Super Bowl 51 is getting Closer! Who are your Winning Picks for this Weekend? Super Bowl LI is getting closer! Mark your Calendars and get the BBQ grills ready for Sunday February 5th! Leading up to that another exciting get-together Sunday will be the NFC and AFC Championships on Sunday, January 22. So who are your picks? 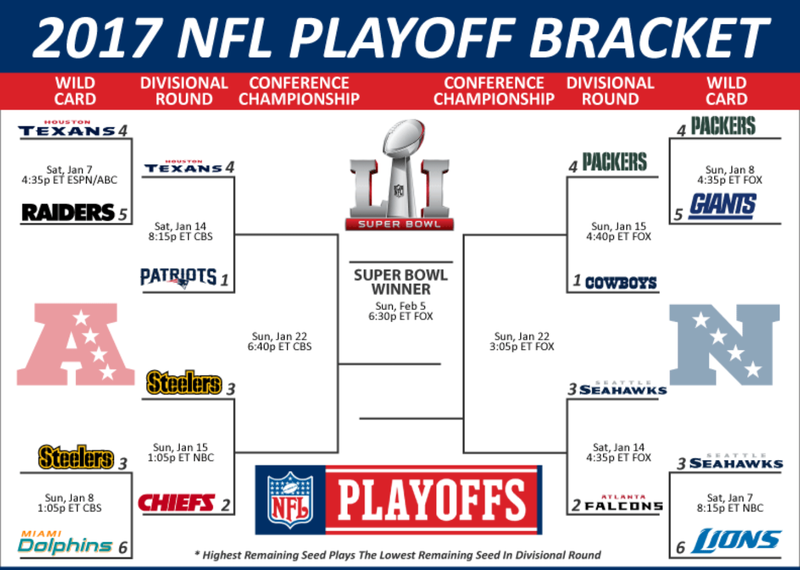 Suga thinks the Patriots (#1 seed AFC division) will head straight to the Super Bowl and would like them to meet the Packers. Patriots should roll over the Texans this weekend. A Vegas Pro predicted that the Falcons (#2 seed NFC Division) will take it all. Hopefully that prediction doesn’t come through. The Falcons will face the Seahawks who are fading away this year. The Steelers destroyed the Dolphins but their QB was limping. He claims he is alright now though and has not been seen limping. We will see if they can manage the Chiefs. It’s time for the Hail Mary King, Aaron Rodgers to get a ring! Did you see how they destroyed the Giants last weekend?! 38-13 was the score. Rodgers came close last year in the NFC Championship vs. the Seahawks but he had a strained calf, preventing him from moving around on the field. He couldn’t even run. It was hard to watch. The Packers will have to shut up those mouthy Cowboys. The Cowboys came into the Playoffs as the #1 seed in the NFC Division and are certainly seeking revenge versus the Packers who sent them packin’ last year with a QB who couldn’t run. Enjoy the Weekend and Drink Responsibly. The fight to play in the Conference Championships was on over the weekend! The Patriots booked their 5th consecutive AFC Championship with a 27-20 win over the Chiefs on Saturday. The Cardinals-Packers game was the highlight Saturday night. Very exciting game. It all came down to a coin toss to head into OT. There was drama where the coin did not flip and had to be tossed again (See video below). Packers QB, Rodgers was quite upset that it came down to that, saw that it was on heads so called tails, then it didn’t flip. Then he did not get the chance to make another call before the coin was quickly tossed again. This situation stirred up talks of changing OT rules so the teams can play out a certain time for a chance of another Hail Mary. But it was clearly fate for the Cardinals who scored the TD first and therefore won 26-20, with Larry Fitzgerald having a huge game and scoring a TD. The Panthers sent home the Seahawks yesterday, totally blowing them out in the first half. The Seahawks haven’t been handled like that in a long time. The Panthers scored 31 in the first half with 2 interceptions and it was enough to hold on to without scoring in the second half and despite a full force comeback by the Seahawks. The game ended 31-24. Panthers QB Cam Newton stated that they just stuck to their game plan and it worked. The Panthers will face the Cardinals in the NFC Championship next Sunday at 6:40pm. After a slow start, the Broncos overcame the Steelers 23-16 to book what is likely to be the final Manning-Brady face off chapter in the AFC Championship with the Patriots next Sunday at 3:05pm.